Thousands of devotees from far off places in the state and neighbouring Andhra Pradesh thronged Tara Tarini temple, about 35 km from Berhampur city, on the occasion of first Tuesday of Chaitra Mela on April 02, 2013. Braving the scorching heat, they climbed the 999 steps of the 17th century temple, on the banks of river Rushikulya, to tonsure the head of their children. Devotees offer hair to the deity, as a part of age-old tradition, on every Tuesday during the month of Chaitra. "I work in Delhi and have come all the way to get my child's head tonsured here," said Deepak Sahu, a software engineer. 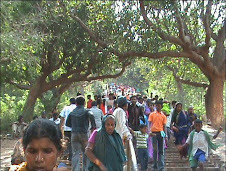 Even though a road has been laid till the temple, most devotees prefer climbing the steps for 'darshan'. "The district administration and the temple administration have made elaborate arrangements for the convenience of visitors," said secretary of Tara Tarini Development Board (TTDB) Pramod Kumar Panda. Water is being provided on the way to the temple along with healthcare facilities. At least 500 police personnel have been deployed to maintain law and order. "No untoward incident has been reported till now," said SDPO (Chhatrapur) A Ch Pahi. The authorities charge Rs 20 for 'Mundan' (close shaving) on the temple premises and only Re 1 for 'darshan', though special darshan costs Rs 50 per head, sources said.